Since I spent the better part of three straight days in pajamas & comfy clothes around my apartment last week, I wanted to share a few of my favorite picks from around the web. When you're stuck inside that long, the last thing you want is to feel like a slob (especially when you can't stop eating homemade oreos!). I like my PJ's to have clean lines (no overly baggy pieces, because I frequently end up cooking when I'm stuck inside) & soft, cozy materials. I'm also partial to my Uniqlo thermals, which are actually a men's XS-and super cheap! They're easy to throw on & layer when you have to leave the house. A cozy, neutral throw is essential to feeling comfy during a storm, & you can never go wrong with a sweet smelling candle to take your mind off your surroundings (like those same apartment walls...for three days). 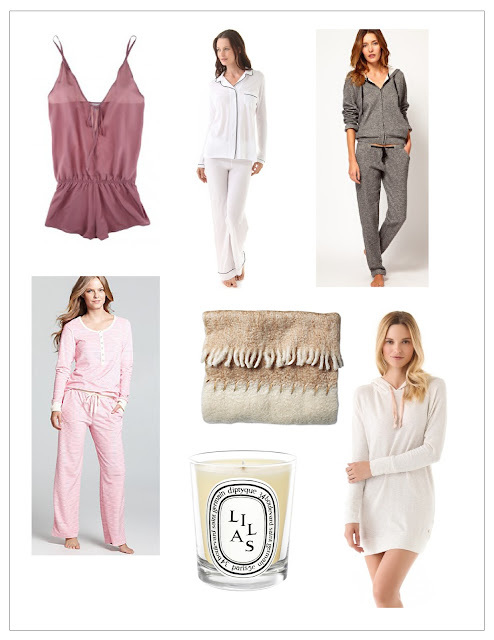 A silky romper can help you feel put together when you finally head to bed. I'm hopeful this week will have a sense of normalcy to it, and on Friday I get to head down to DC to spend some time with my family, my mom & sister will be there the entire weekend!